Oakland's Dan Straily delivers a pitch in the first inning against the Twins. By the time Dan Straily took the mound for the second inning, he knew he just didn’t have it. His velocity nowhere to be found, the 25-year-old right-hander took the next step in his maturation process by gritting his teeth, focusing on location and changing speeds over anything flashy and shutting down the Minnesota Twins. Straily pitched three-hit ball for seven innings and Sam Fuld hit a rare home run to help the Oakland Athletics complete a three-game sweep with a 6-1 victory Thursday. ”It’s part of learning from the past, from last year,” said Straily (1-1), who gave up one run and struck out five. ”On days when I didn’t have my best stuff, I would try to pitch like I did and it would cost me. After the second inning, I realized I didn’t have my `A’ stuff in my arm today. So it was just a matter of mixing speeds and keeping everybody off balance." The Athletics’ rotation has opened the season with nine straight starts allowing three runs or less and has compiled a 1.93 ERA in 56 innings. Fuld hit just his sixth homer in 738 career plate appearances and singled. Donaldson had a two-run homer and an RBI single for the Athletics (6-3). Mike Pelfrey (0-2) gave up six runs on nine hits and four walks in five innings. The Twins have had only one quality start in their first nine games. Brian Dozier hit his third home run of the season for Minnesota. Straily was selected in the 24th round of the 2009 draft, just another in the seemingly endless line of young, strong starting pitchers churned out by Billy Beane’s Moneyball machine. Pelfrey had no such luck, laboring through another poor outing for Minnesota’s starting rotation. Donaldson’s homer in the third inning put him behind 3-1 and he walked No. 9 hitter Nick Punto in the fourth before Fuld yanked a pitch just over the wall in right field for a 5-1 lead. ”I think all the way around, I was terrible today,” Pelfrey said. 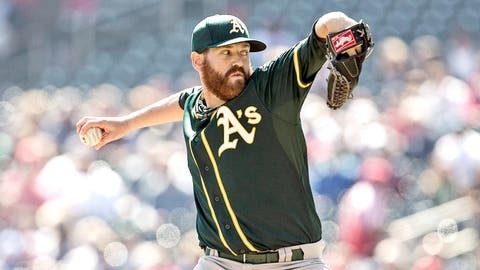 The cushion allowed the A’s to avoid a save situation on the same day Melvin demoted struggling closer Jim Johnson, who is 0-2 with an 18.90 ERA in five appearances this season. The A’s will go with a closer-by-committee approach while they try to get Johnson straightened out, Melvin said.